Select the length of of comb. It is best to count the number of holes you punched into your pages--a ring of the comb will fit into every hole, so by counting the holes of your page, you will know how many rings are needed. Custom length binding combs are now available from MyBinding.com. Whether you need really short combs for binding coupon books or really long combs for binding calendars or music scores we have what you need. Simply choose the color, size and length that you need. Prices are per 100 combs. Please note that these are custom made lengths and may take 3-5 business days before shipping and are non-returnable. 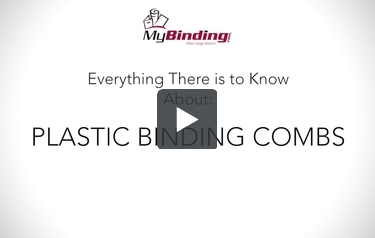 If you need a size, length or thickness not listed above give us a call at 1-800-944-4573 and a MyBinding.com sales specialist will be glad to help you. We use these bindings to create a church directory every year and I love that we can get quality custom bindings at an affordable price! Exceptional company with exceptionally fine products and people. Other companies should follow their business practices and standards. I have a book that is 6X9X1 inches, 600 pages. Do you have a comb to fit this size? Thank you for your question. Unfortunately we do not have a comb that would be able to hold 600 sheets. The largest size of comb (2" diameter) is only able to hold up to 425 sheets of 20# paper. To bind a tabloid (11x17) on 17 side, how many holes do you need? Do you sell pre-made ones for tabloid paper or do I need to order custom? Thank you for your question. To bind on the 17" length of a tabloid size sheet you would need to go with a custom cut comb. For the length (# of loops) you would want to punch a sample and count the holes to determine the # of loops (length) that you need. The exact # of holes can vary depending on how the punch is aligned and custom cut wire may not be returned if you order the wrong size. You can find the custom cut combs here . I am looking to bind 5x7" (w x h) handbooks for my staff. The handbook will range from 50-75 pages. What size and length combs would I need? Thanks! Thank yo9u for your question. For 75 sheets of 20# paper you would want to go with a 1/2" diameter. If you are using a heavier weight of paper the general rule of thumb is to add 1/8" to the thickness of your completed book ( including covers) to determine the size of spine that you will need. For the length (# of loops) you would want to punch a sample and count the holes to determine the # of loops (length) that you need. The exact # of holes can vary depending on how the punch is aligned and custom cut wire may not be returned if you order the wrong size. 100 pack of 21 rings for $27.53 - is that a variety pack with different sizes and colors? Thank you for your question. The Custom Length Binding Combs come as a pack of 100 of the specific size and color that you select. All 100 spines would be the same size and color. Unfortunately there is a not a variety pack of combs available. I was wondering if im binding engineering plans 11x17, in various page counts, what size should I get in the plastic combs? would it be 11? Thank you for your question. If you are looking to binding on the 11" side of the sheet you can use a standard 11" binding comb. If you want to bind on the 17" side of the sheet you would need to go with the custom cut combs. Custom cut combs are sold by the loop not the inch. What you would want to do is punch a sample and count the hole to determine the number of loops. The diameter of comb you would want to use will be determined by the thickness of your document. You can find out sizing guide here . I need to bind an old cook book, page size is6 by 9, the rectangular punches are one quarter inch apart and there are 16 puncheon the sheet. I need to fasten 250 pages. Possible? If the book you are binding already has the rectangle holes, you can rebind it. You want to select the size of your book and add 1/8th of an inch to it. If you need help ordering the correct size, please contact us at 800-944-4573. Can you ship to South Africa, and is the courier price constant or will it have changes because I am in a different country? What size comb will I need to bind 1100 pages? Thank you for your question. Unfortunately there is not a comb large enough to hold 1100 sheets. The largest comb is 2", which can hold up to 425 sheets of 20# paper. Thank you for your question. Unfortunately we do not have a machine that will be able to punch a 17" wide document in a single pass. There are several options available where you would be able to punch a 17" wide document in 2 passes using a machine with a open throat. A continuous punching guide makes lining up the second punch a lot easier but unfortunately there is not a Comb Binding machine with that option. Akiles makes a couple Coil Binding machine with a continuous guide though. Hello, thank you for your question. The 21 ring in comb binding is generally for the A4 size paper. The largest 21 ring comb we have is 1" which holds approximately 200 pages of 20 lb paper. Any larger combs which traditionally fall into the 19 ring category have a lock on both ends to keep the comb closed. But that would possibly require re-punching of all of your documents. Do you have a machine that will bing 11X17 paper? Thank you for your question. Any comb binding would be able to punch and bind the 11" side of a 11" x 17" but, unfortunately there is not a comb binding machine that can punch the 17" side. There are Coil binding machines that have a open throat ( to accept wider paper stock) and a contentious punching guide that helps keeps spacing between the holes even on the second punching pass. I want to bind 12'12 pages with a comb for caledars and book pages created on the computer. Are there machines available for small office use to bind this size sheeet page.? Thank you for your question. There are definitely machine that are able to punch along a 12" side of a page. The Tamerica Optimus-21 has a 12" throat. There are also comb binding machines that can work with Legal sized paper ( 14"). IF you need assistance in selecting a machine give our customer service department a call @ 1-800-944-4573 and we would be happy to help find the best machine for you. If you document size is a 5X7 how do you cut the ring to fit? Thank you for your question. When ordering Custom Length Binding Combs the length of the comb is determined by the # of rings. The best way to determine how many rings you need is by punching a a sample and counting the holes. It is important to do this as a a custom made item Custom Length Binding Combs are not able to be returned. How would I calculate how many rings I need any size paper? Custom length combs are ordered by the ring. The best way to insure you get the proper size comb is to punch a sample and count the holes. You want to take this step every time because custom length combs are not returnable and made to order. How come the custom comb lengths are in rings not inches ? The primary reason why we sell these by the ring instead of by the inch is that different customers choose to punch their documents differently. This way you can punch a sample sheet count the number of rings that you need and you will be guaranteed that the combs will fit. We would hate to ship you a box of custom length combs to find out that it won't work for your specific application.